Cholesterol Efflux Assay Kit ab196985 is a high-throughput, cell-based screening assay for measuring cholesterol efflux. The cholesterol efflux assay protocol uses fluorescently-labeled cholesterol (Ex/Em 482/515 nm). It provides a safe, sensitive and reproducible method for measuring cholesterol efflux. - screen small molecules for their effect on cholesterol efflux as a part of drug discovery program. Cholesterol efflux from the peripheral tissues and cells in atherosclerotic plaque is an initial and critical step in Reverse Cholesterol Transport (RCT). RCT is the process by which extra hepatic cells, including macrophage-derived foam cells in arterial atherosclerotic plaque, transport excessive cholesterol back to the liver for bile acid synthesis and excretion, thus lowering the peripheral lipid burden. 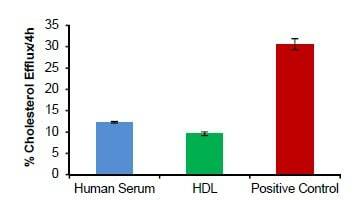 J774.1 cells were labeled with the Labeling Media and treated with various cholesterol acceptors like Human Serum, HDL (50 µg) or Positive control known to cause cholesterol efflux. Cholesterol efflux is expressed as % efflux elicited by cells in 4 hours. There are currently no Customer reviews or Questions for ab196985.